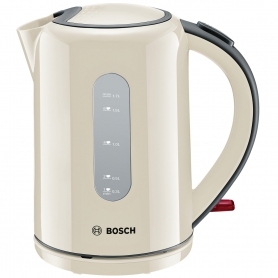 Thanks to its large 1.7L capacity, the Bosch TWK76075GB kettle is able to make more hot drinks from just the one fill. Thanks to the double sided water indicator you can easily see how much water you are putting in and the 360 degree base makes it perfect for left or right handed users. Filling the kettle couldn't be easier with the one touch lid opening it can be done simply without any spillages. The removable limescale filter will keep your kettle like new for longer and your drinks tasting fresher for longer. The boil dry protection will protect your kettle from them moments you forget to refill it, it will automatically switch off if there isn't enough water in the kettle. The illuminated on-off switch makes it easy for you to see when the kettle is on or off.